Next post will be what happens to INSERTs, and then UPDATEs. data1 and data2 are each 256B, so in total 512B was read. 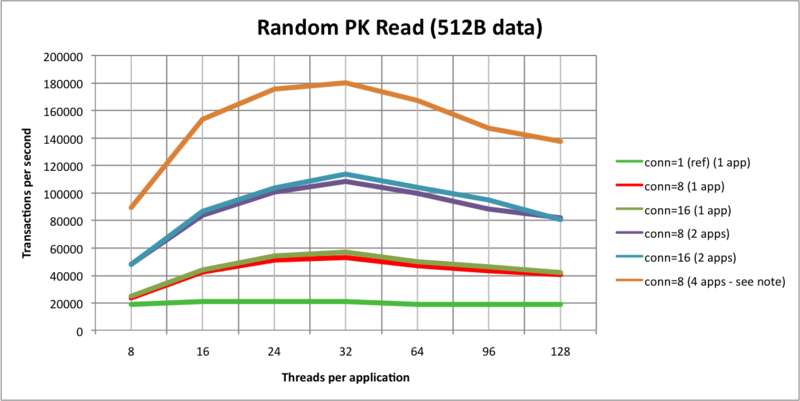 There was 1M records in total in table t1, but this does not matter as the SELECT is on the PK (hash index) so it could have been 100B rows (if i have had the storage for it). but only 256B of each 512B varchar was filled with data. Going from one mysql server to two mysql server gives a 99.9% throughput increase (32 threads). At this stage I wanted to try with four mysql servers, as the two mysql servers were completely CPU bound at this stage. Going from two mysql servers to four mysql servers gives a 66% throughput increase. However, two of mysql servers were located on dual core, dual cpu, instead of dual cpu - quad core. The Dual CPU/Dual core servers were saturated already at 16 threads connected to MySQL. I expect, with similar hardware to get well above 200000tx/s. 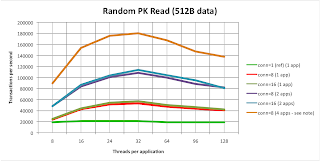 The MySQL servers on the dual cpu/quad core machines could do 52000tx/s, but the dual cpu/dual core could only handle ~ 38000tx/s when executing the SELECT from 32 threads. Hence, more than 200000tx/s should not be impossible, which would be a 92% increase in throughput compared to 2 mysql servers. It would be fun to test with 16 or 24 core machines, but I don't have those. It would also be fun to test with faster CPUs. The data nodes were not saturated on the peak results, but pay attention to the TC thread as in this case it accounts for most CPU util within the data node. Latency numbers - i have them if someone is interested. I think, despite MySQL Cluster being a relational database and despite we are using SQL, it is possible to get some decent numbers, and good scalability.